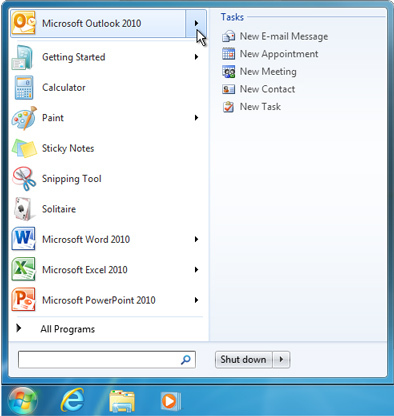 New email messages, appointments, meetings, contacts, and tasks can be created from the Windows 7 taskbar or Start menu using Jump Lists. Jump Lists give you quick access to creating Microsoft Outlook 2010 items without switching from another program that you are using. And, if Outlook isn’t running, you can still send a message or meeting request, or create contacts, tasks, or add an item to your calendar by using Start menu Jump Lists. Tip: You can also use the Jump List if Outlook is pinned to the taskbar. 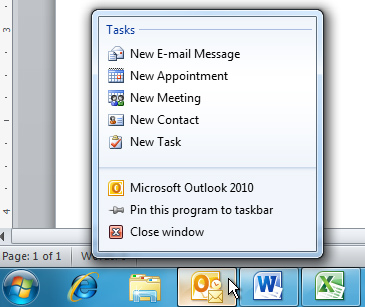 For more information about pinning programs to the taskbar, see Pin a program to the taskbar. Right-click the Outlook button on the taskbar. Click New E-mail Message, New Appointment, New Meeting, New Contact, or New Task. Jump Lists appear on the Start menu for items that are either pinned or are in the recently used program list. You can create new Outlook items, even if Outlook isn’t running. Tip: For more information about pinning programs to the Start menu, see Pin a program to the Start menu. Click Start, point to Microsoft Outlook 2010, and then click New E-mail Message, New Appointment, New Meeting, New Contact, or New Task.